In addition to our Craft Club meetings once a month, we love to surround ourselves with other creative girls (and guys). They continue to inspire us every day, and our friend Ashlee is no exception. Therefore, we were super excited when she accepted our offer to create a guest blog post to show off her new endeavor. 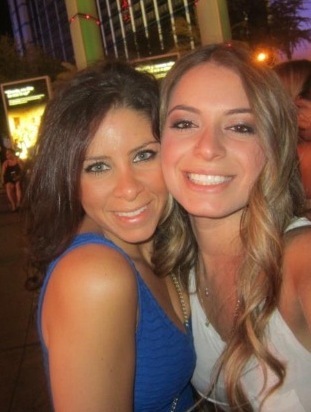 We are also delighted to add Ashlee’s friend Sharon as a new guest blogger on Side by Side Design. Thank you girls for sharing your creative ideas with all of us. Hi Everyone! You might remember me (Ashlee) from my previous guest blog on Side by Side Design all about my Fall holiday treats (Guest Blogger: Ashlee’s Fall Treats). Well I am back … nice to see you all again! And I join you with one of my best friends, Sharon! Sharon and I are in the beginning stages of starting our own business together! So when Tami and Lauren asked me if I’d like to guest blog again, I knew that the Side by Side family was the perfect audience to introduce our product to, as its readers (and writers, I might add) are some of the greatest creative thinkers out there! So … here goes nothing! We are Sharon and Ashlee … two girls trying to put our creative minds together to bring you a new and fantastic way to keep some of your most precious memories. Pinterest is the latest craze these days, right? We would know as we often text each other at 2am because instead of sleeping like normal people we are pinning delicious yummies, fitness inspiration, and of course planning our imaginary weddings (you know you’re guilty too!). As Pinterest becomes more and more popular, it seems that all of you readers are turning to its fabulous ideas to plan your weddings, bar/bat mitzvahs, baby showers, birthday parties, etc. But what do you do with all of the “things” you accumulate from your event that you just can’t bring yourself to throw away??? You put them in a cardboard box high up in a closet somewhere in your house where you only get to revisit those memories when you decide to do your dreaded Spring cleaning, right? WRONG! You call us, Sharon and Ashlee, the ladies of “Treasure to Remember”. We will take your monogrammed cocktail napkins, your place cards, your invitations, your photo booth pics, your baby’s first ultrasound picture or onesie, and any other tangible memories you have collected from your event and turn them into display boxes that you can hang in your house so you can relive your beloved memories for a lifetime. Here is an example of a display box we created for Sharon’s sister and her one year old son. For this box, we included baby’s first ultrasound picture, baby’s hospital beanie, the blanket he came home from the hospital in, a couple pairs of his baby socks (because we all know how tiny baby feet make us warm and fuzzy inside), his first kippah and kiddush cup, a copy of his first footprints, his hospital bracelet, and some of his favorite toys. If you have a baby on the way, we can also include shower invitations, baby announcements, progress pictures of your belly growing, etc for you to hang in the baby’s nursery so that you can share your pre-baby journey with your little one, one day. 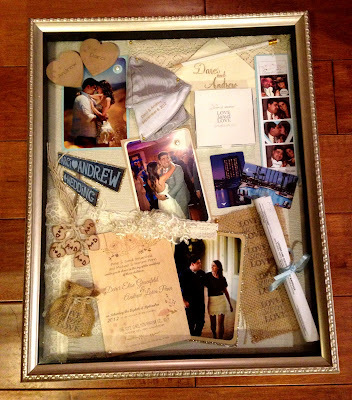 Here is another box that “Treasure to Remember” put together for a true Pinterest wedding. For this display, we made sure to include this couple’s amazingly original wedding invitations, which were made of wood! Her invitation “packages” also included the printed strip of burlap and the small burlap pouch that had jelly beans inside of it – all of which we included in the display case for the couple to remember. Also included here is the bride’s garter, the couple’s hotel keys to their honeymoon suite at their wedding venue, the kippah with the bride and groom’s name printed on the inside, a copy of their marriage license rolled up, and even the tiny boxes that the pizza hors d’oeuvres were served in! We were sure to include some lace detail and pearl accents to complete this look and make it ready to hang in the newlywed’s new home! 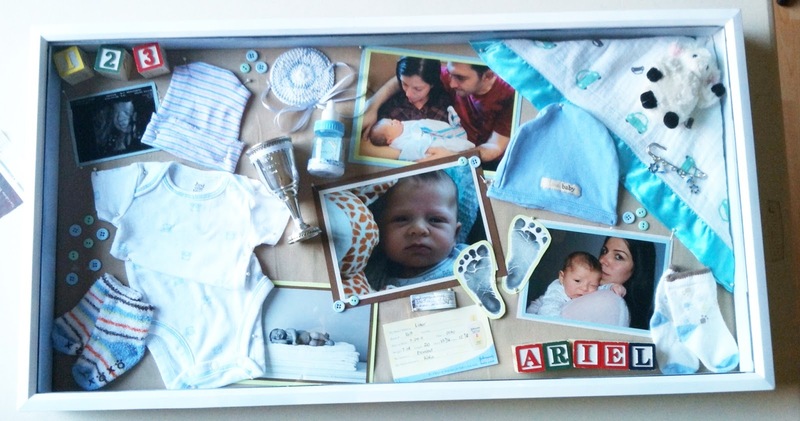 We would love to create a display box of your memories for you to treasure forever. Have a baby on the way, do you have goodies from your shower, wedding, or Bar/Bat Mitzvah that you don’t know what to do with? 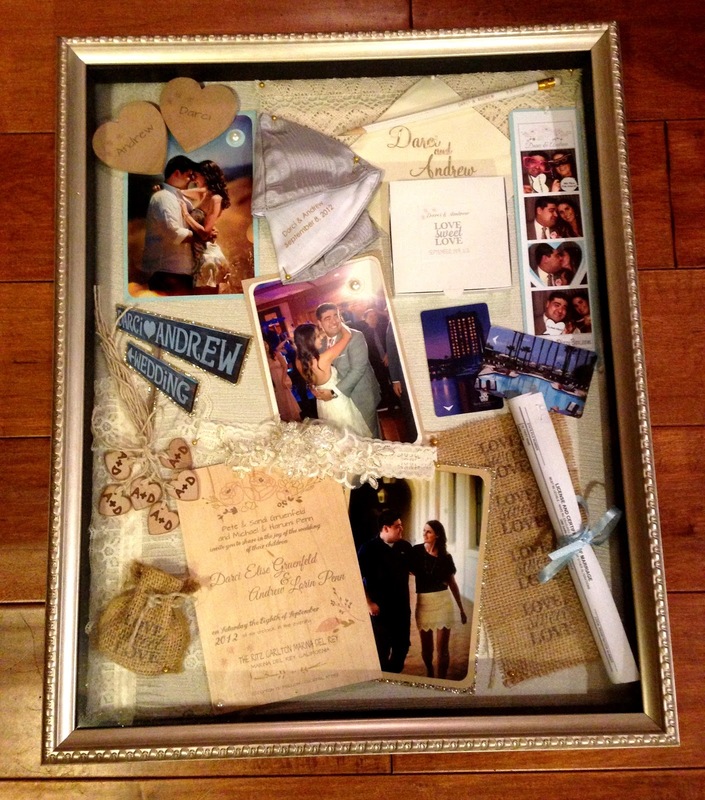 Did you collect some great keepsakes from your recent travels that you don’t know what to do with? Want to spoil your significant other with a fantastic keepsake of the memories of your relationship for an anniversary or Valentines Day or even the upcoming holidays? WE ARE YOUR LADIES! We do it all! Don’t forget…these are YOUR memories so we will include whatever is most important to you and we will be mindful of the color schemes that are to your liking! Please feel free to message us for details. If you are not local, we will send you a pre-posted box for you to send us your treasures in. Prices vary depending on frame size and color and how many treasures you want included in your display box. We can be contacted at treasuretoremember@gmail.com . We look forward to hearing from you all and please tell your friends about us too! Now that Thanksgiving is over, the holiday season has officially begun. We thought we would get it started here at Side by Side Design with a little Winter inspiration this morning. We truly believe that the look of your home should be carried all the way through to the decorations you put out for the holidays or even a party. Once again, we have put together two individual looks, representative of our own personal styles, that show you how we incorporated the holidays with an already existing home decor. This season, let the style of your home guide you in the decisions you make while decorating for the holidays and the new year. Tami’s Pins: Who says the best time to get married is during the Spring and Summer? Weddings bring families together and so do the holidays. Therefore, it should only make sense to combine the two. This season, I have chosen beautiful photographs as inspiration for a rustic yet glamorous Winter wedding adding in touches of the holidays and a bit of whimsy. This interior sets the tone for my rustic yet glamorous wedding inspiration. A cozy set up like this would even be nice somewhere within the wedding venue as a place to lounge or rest your feet. Formal chandeliers dress up even this rustic barn making it the perfect place for a Winter wedding reception. 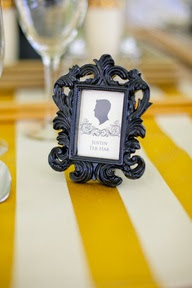 These place cards are fun tucked away in big wooden boxes filled with baby’s breath. Simple yet elegant flowers in glass vases surrounded by tea lights is the right amount of glamour for this rustic venue. I fell in love with these adorable napkins. How fun would they be at the end of a buffet table or lined up on long dining tables? This potato latke appetizer looks amazing and is festive too! Blueberry muffins wrapped in craft paper are a fun and unexpected treat for a wedding. These take home gifts follow the theme with their burlap, bit of sparkle, and a touch of pine. I love the idea of finishing off the night with s’mores outdoors. Although I wouldn’t be found without my fur bolero. Lauren’s Pins: Anyone who knows me knows that I am obsessed with white (well, mostly for designing purposes). So you shouldn’t be surprised that I decided to go with an all white theme for my at home New Year’s party inspiration. Adding in silver, glitter, and fur were just the right touches to complete my look this Winter. This all white living room is beautiful with its floor to ceiling draperies, painted wood floor, and the fur throw on this adorable white baby rocker. This beautifully designed bedroom would look perfect in the same house. I love the simplicity of the modern bed against the moldings on the walls. The fur throws set it over the top for me. Adding star details to the dining room chandelier lends a festive touch. The dessert bar can be found perfectly displayed behind it. This festive cake adds to the dessert bar. I love the tall star cake pennant it features. Mountains of marshmallow frosting … how can you go wrong? Hot chocolate is a must for this dessert party. One more star detail continues the overall look. This decorative accent would be adorable displayed in the center of a table to add a little glamour to the room. 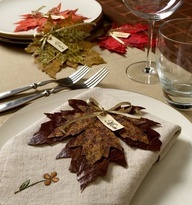 These confetti paper place mats would be a nice touch for guests to use as they enjoy their treats. I would be just as happy to live in it here in Los Angeles. Now that we are done dreaming, we look forward to coming up with ideas to complete our Winter decor in our own homes. We would also love to work with you “Side by Side” in planning your upcoming Winter events. Contact us at sidebyside.design@yahoo.com for more information. 1. Mason jars can be found online or at Smart ‘n Final for a very reasonable price. The bigger the jar the bigger your pies are going to be. Note: try to find ones with a larger opening. It will make your life easier if you can stick your whole hand in the jar. 2. Combine Libby’s Easy Pumpkin Pie Mix in a can with evaporated milk and eggs. Follow the instructions on the can for the amounts needed. This will also depend on how many pies you are going to make. 3. Create the pie crust recipe of your liking. Ours consisted of flour, salt, water, and butter. Mix well and knead into a dough. 4. Take the dough you have created and press it into the inner sides of your jars until you cannot see through the glass any longer. 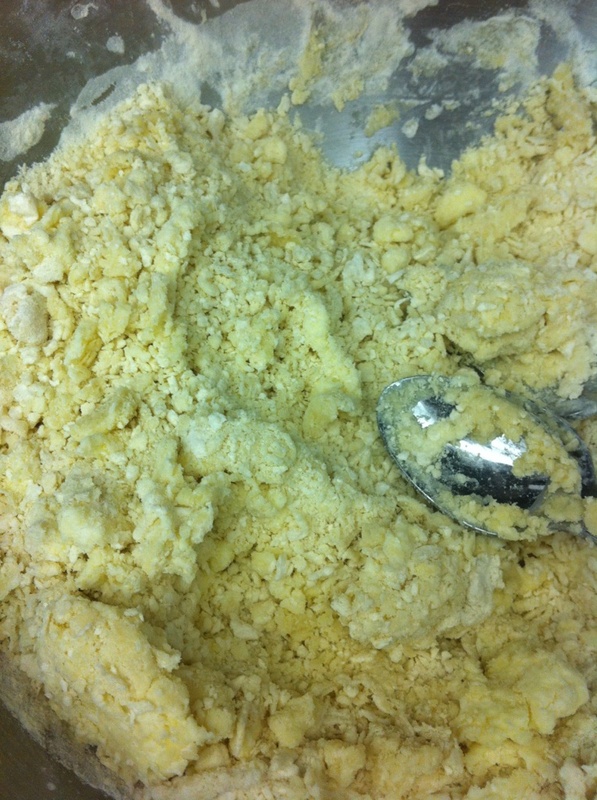 This will become your pie crust. Fill the inside of each jar with your pumpkin pie filling and place it in the oven at 325 for 30 – 35 minutes or until golden brown and slightly bubbling. 5. Wait for your pies to cool before returning the lids to each jar. If you are not going to use the pies for a couple of days, it is best to refrigerate them and reheat or wait to bake until the day of. 6. Decorate your jars with raffia, ribbon, fabric, or any other festive material and enjoy. They taste amazing! We turned our pumpkin pies into Thanksgiving place cards by tying tiny decorative frames to them. Each frame was spray painted metallic gold with the inside in chalkboard paint at our last Craft Club meeting. We know they will spruce up our holiday table. At this time of year, we try to really sit back and remember what we are thankful for. This year, we are most thankful for our family and friends and the guidance that they give us each day. We are also thankful for the continuous support from our readers. You keep us excited to write each and every post! Happy Thanksgiving from Side by Side Design! We made this kale salad with dried cranberries, pine nuts, lemon juice, salt and pepper. It is as easy to make as it sounds, really healthy, and beyond delicious. To make these turkey cranberry wraps, begin by spreading cream cheese on a tortilla. Add sliced turkey and sprinkle dried cranberries and chopped green onions on top. Roll the tortilla with all of the ingredients inside and cut on an angle to create bite-sized wraps. … and an added bonus way to use cranberries! Here is an extra bonus cranberry idea for our readers to make it up to all of you for not posting on Friday. Unfortunately, we cannot post the recipe for these spiced cranberries as it is a secret family recipe and our grandma would probably kill us. However, if you can find a spiced cranberry recipe to add to your Thanksgiving menu this year, we promise you will not be disappointed. They are seriously our favorite addition to our Thanksgiving meal. A few years ago, we took over the responsibility of making them for our family’s Thanksgiving dinner. They are prepared a week in advance, so we have already made this year’s batch and can’t wait to eat them. They smell so good. We would love to know, what is your favorite part of Thanksgiving, and do you have a favorite cranberry recipe to share? We hope we are finding all of our readers enjoying the official start to this year’s holiday season. Eat lots of turkey this Thursday, but don’t forget to save room for the cranberries! Now that we are three months in, Craft Club has officially become a monthly event in our lives (as well as our friends). This week we had the honor of hosting this event at Lauren’s home as each of our guests created place cards for their very own Thanksgiving tables. As the hosts, our responsibilities were to set up a place for our guests to work and provide a few snacks for them to eat. Often times our meetings are after a long day at work, and as we all get hungry at this time, the girls are always very good about also bringing their own snacks / drinks to share. Needless to say, our potlucks are never lacking in taste or variety. As the hosts, we wanted to start off the potluck with a festive Fall feeling. We prepared three Fall inspired treats for our guests: apple cider sangria, turkey cranberry wraps, and cranberry orange bars for dessert. (Check out Friday’s bonus post for a closer look at some of these delicious recipes.) One of our club members even brought this amazing scotch chocolate cake that was homemade by her sister. To an outsider, the Craft Club table may look like a huge mish mosh of random materials. However, we pride ourselves in saying that our members are very creative and always turn what may look like a little bit of this and a little bit of that into a masterpiece. It’s also a great opportunity for us to get caught up in each other’s lives and even occasionally make a new friend. 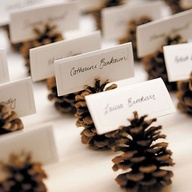 Bits of ribbon, mini pinecones, and glittered leaves were found on a few of our guests place cards. We are sure their families will love to add these creations to their Thanksgiving tables when each girl travels home for the holiday. Another friend of ours will be celebrating her Thanksgiving with family as well. She decided to make a gift for her host, a festive wine holder decorated with Fall leaves and shimmery gold pinecones, instead as she will not be hosting this year. Here is a glimpse at our gold framed chalkboard place cards. 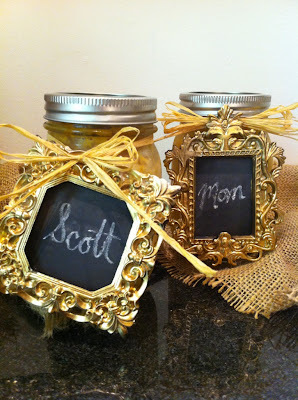 We are going to be hanging these mini frames from mason jars filled with pumpkin pie (full post coming soon!). As always, we truly enjoyed this month’s Craft Club meeting. We look forward to making holiday treats next month with “the girls” and creating decor for our homes and / or Christmas trees. We hope we have inspired you to create your own Thanksgiving place cards this year. Keep on crafting!